Viewer dropped these old photos in our inbox. 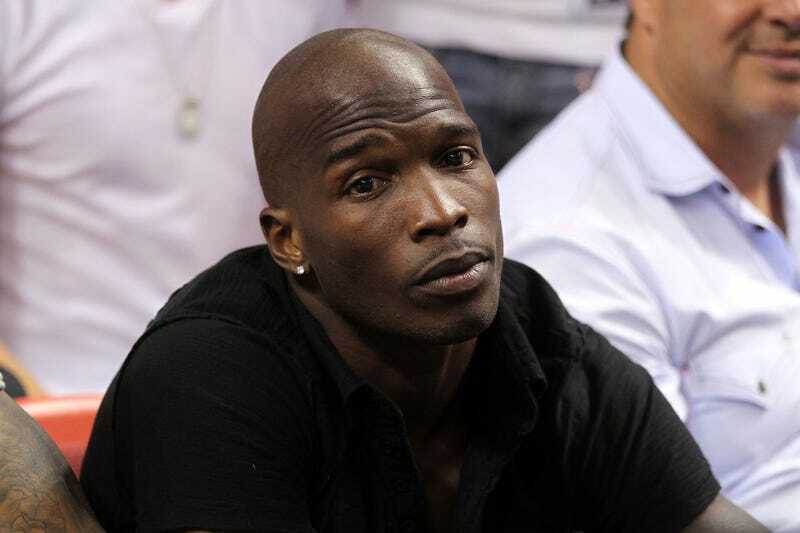 Allegedly Chad Ocho Cinco giving ol' girl the business. The photo is really a video that was taken as a screen-shot during Chad's alleged sexcapades with a full audience in the background. In the photo you can see what appears to be Chad hitting it from the back, and another photo of the stripper riding Chad until the wheels fall off. While everyone in the background was getting an eye-full, one woman wanted to treasure the moment forever and record it. You can see her doing so in the mirrors reflection. This was reportedly shot "roughly three years ago" so it was actually a little while until the wheels truly fell off for Chad in New England. Nevertheless, Johnson admitted that the person in the video is him, and assured TMZ that he didn't release it to get attention or find a buyer, a claim that's bolstered by the fact that it came out on Christmas (bad strategy if you're looking to create a stir) and undermined by the fact that Chad Johnson is bored and likes attention. Here's a screenshot! You can head over to WorldStar if you want to see all of the two seconds of Chad in motion that have been released so far. It's the fastest he looked since he was on the Bengals.